If you are like me, you don't pay attention to most commericals or when the kids are watching TV, its usually when you are trying to get some cleaning or work done. That or you have seen every show on Sprout, Nick Jr, Disney Jr and the Hub. I am slightly out of touch with newer toys coming out unless I have seen them at an event, or they are pointed out to me at a store. After Blogger Bash I was personally introduced to hundreds of toys and after I received a box of goodies from many of the brands at the Bash. One such toy was BEADOS by Moose Toys, I had no idea what this little bag was, but Jack sure did and immediately began singing the song from the commerical is what he told me he was doing.. "ba ba ba ba BEADOS" on repeat and saying "I always wanted this, can I make it now?" 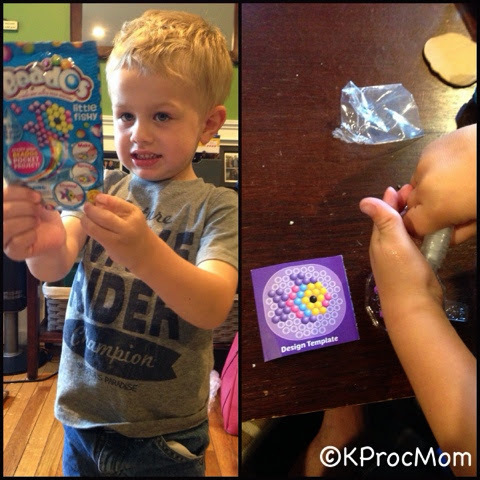 Intrigued by his urgency to play with this and curiousity of what was inside and exactly what it was I let him open the little package (sample pack). All I could think was ADORABLE!!! 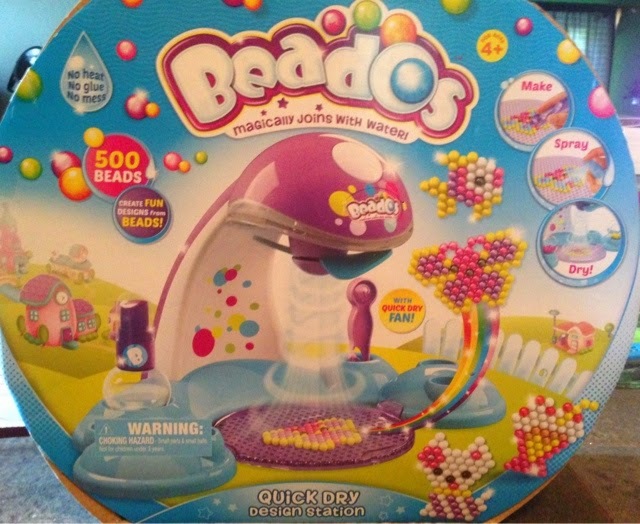 BEADOS are beads (well, duh!) that you place in a tray, which a design template is held under. Our little package was a fish. Once all the beads are placed and everything must be touching, you spray with a tiny spray bottle that comes with set. Following directions and you let it sit out and set, the waiting time is the hardest for kids, Jack just wanted to play. Once dry you peel off tray and have your design, some kits come with stands, others come with pieces to hang them, the options are endless. 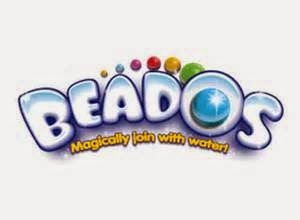 Beados have been an international sensation making over $150 million in retail sales in its first year, in over 80 countries. 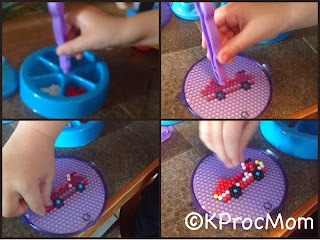 *Fine Motor Skills (OT) work, either by just picking up the BEADOS with your fingers (pincher grasp) or using the tweezer tool, you are working your hand with these tiny beads and then placing them on template tray. It makes kids work, it slows them down by only doing one at a time too. 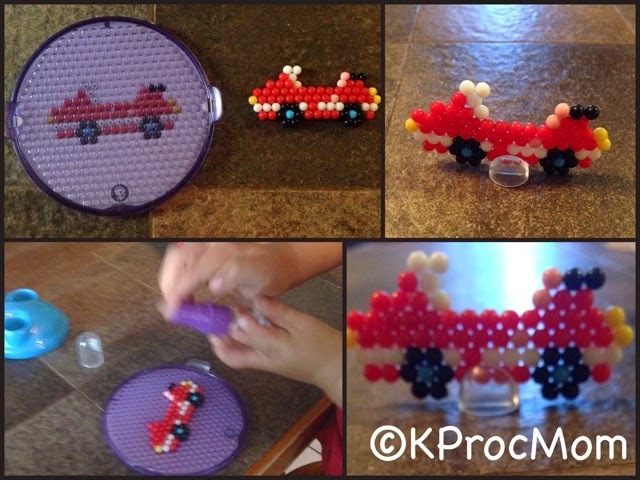 *You can study colors, the bigger seats come with a tray to sort the beads. While working with your child: you can ask what color they picked up, ask them to get a certain color, and count the different color choices. *Virtually no mess. Clean up is a breeze. 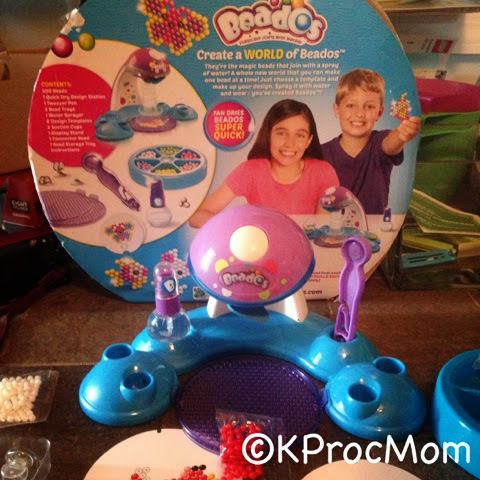 Disclosure: I was sent a BEADOS Quick Dry Design Station to review with the kids, no other compensation was provided. As always all opinions are 100% my own and honest.